I’ve always been more excited about the side dishes at Thanksgiving dinner than the actual turkey. 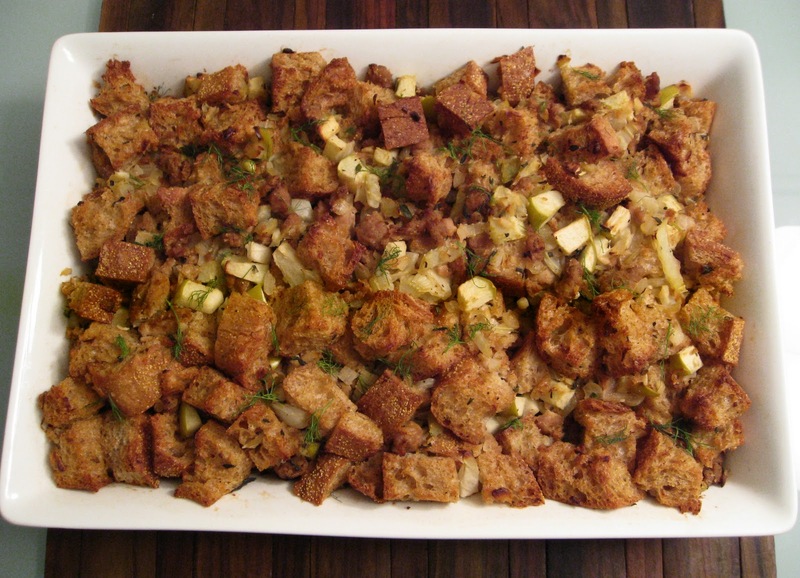 When I was growing up, making the stuffing was always my job and that meant using the kind that comes in a box. Then one day I tried making homemade stuffing and since then, I’ve never gone back to the boxed variety. I like making stuffing from scratch not only because I can add my favorite ingredients, but also because I can control the amount of salt- most boxed stuffings are loaded with sodium. Instead of using butter, I cook the vegetables in heart healthy olive oil. In this recipe, I skip the white bread and use a delicious loaf of whole wheat ciabatta from the bakery section of my grocery store. And by substituting turkey sausage for pork, I cut plenty of calories and fat. So this year, add this side dish to your Thanksgiving menu and you won’t feel guilty for overindulging! Place the bread cubes in a single layer on two baking sheets sprayed with cooking spray. Bake 15 minutes until bread is toasted, stirring halfway through. Place in a large bowl. Meanwhile, heat a large skillet over medium heat and spray with cooking spray. Add the sausage and brown it, breaking it up into pieces as it cooks. Place the cooked sausage in the bowl with the bread. Heat the oil in the skillet. Add the onion and fennel and cook 7-8 minutes until partially softened. Add the garlic, apple, sage, thyme, salt and pepper and cook another 5 minutes. Add the mixture to the bowl with the bread and sausage. Whisk the chicken broth and eggs together in a measuring cup. Pour it into the bowl and stir to combine all ingredients well. Pour the stuffing into a 13x9-inch baking tray sprayed with cooking spray. Cover the tray with foil and bake 20 minutes. Uncover and cook another 20 minutes until top is golden. Garnish with reserved fennel fronds.